Last year it was the boyfriend jean and this season it’s all about the wide leg look. I have big thighs as it is, so this style is NOT for me, but just in case you wanted to give it a shot, here’s a few different options to show you how to wear wide leg jeans. Always with a heel – ALWAYS. 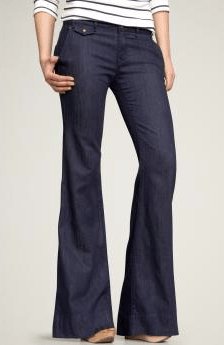 Wide leg jeans are very long and you need a little heel to give your legs some shape. Don’t really worry too much about how the shoes looks because in the end, the majority of it will be covered by the jeans. With a free flowing shirt (and a tank b/c that shirt is see through) or something with some definition. Both of the bottom shirts have a tie belt. Wide Leg jeans are pretty versatile. If you want to do something a bit tighter, consider pairing the wide leg jeans with a fitted cardigan. You can really have a lot of fun with wide leg jeans. Unfortunately, I’m going to sit this one out, but let me know how you do!! Oh and PS – Old Navy has a great pair that will run you only $30!! I just bought @ pair of wide leg Hudsons one that is a dark and one that is normal demin…they are beautiful on but I still love my skinny jeans too!! Where is the speckled ruffled sleeveless blouse from? I love it! Well, if it was $400 then it doesn’t matter where it’s from! LOL.